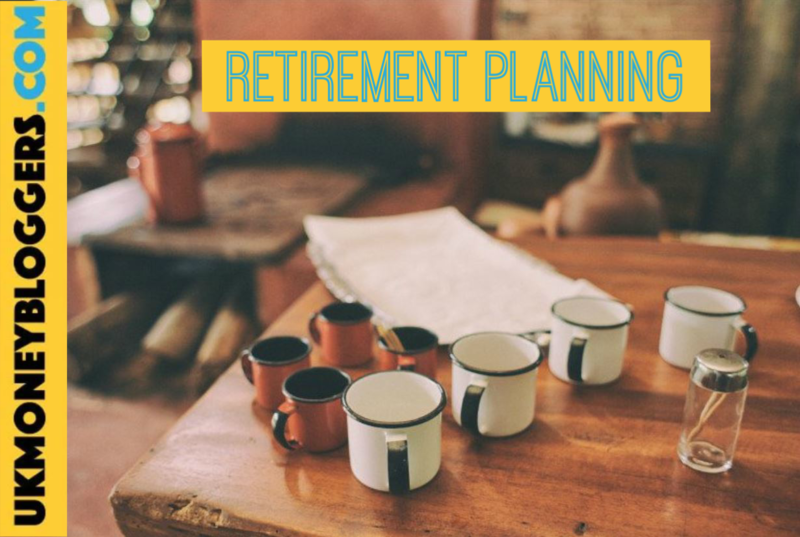 Have you started planning for your retirement yet? There are lots of pain-free ways to plan for your retirement so this month, to inspire you, the UK Money bloggers are sharing their own personal experiences with you this. I’m going to tell you about what I do first because I’m really late to the retirement planning party so I’m trying to hit it as hard as I can right now! I’ve spent years just concentrating on paying off debts and paying the bills from month to month but in the last year or so, I’ve got to the stage where I’ve paid off all debt and have managed to reduce our outgoings to the level where we actually have spare money each month. We’ve used the extra money we have wisely by increasing our workplace pension contributions, investing in our work share save schemes and overpaying our mortgage each month so that, in theory, we’ll be in a much better position by the time we’re 50 with no mortgage, a healthier pension pot and money from our share investments sat in a savings account. Here’s what some of the other UK Money Bloggers do…. I have set up an ISA – my plan is to pay off this house then downsize and use that money towards my pension. I do envisage I will work to a grand old age! I also have some old pensions from my council days but they are very small. I worry constantly that I will not have enough though! Emma has some great advice for you that is definitely worth considering if you aren’t currently signed up for child benefit! It’s so important for everyone to max out their contributions and get matched free contributions from employers. I also save 10-15% gross in an Investment ISA so that I can retire before 55yrs on my own accord. I wish someone taught us at school how to save for our future as I think this is a way for women to be empowered too, so we can truly balance work and family when we choose and know our future is secure. Actually for men equally too! Knowledge is power but action is powerful. We started buying rental properties in 1997 having spotted a gap in the market for one beds and studios. We used every penny we could save for the deposits and ploughed everything back in until in 2001 we could both leave salaried work. We then bought, refurbished and sold for a few years. We started because we felt we couldn’t rely on pensions, so many things were going wrong, this was our safety net. As I’m self-employed, I don’t have the luxury of a boss to choose a pension for me, and pay contributions on my behalf. But I’m still a fan of pensions because of all the free money added as tax relief – an extra 25p on top of every £1 I pay in. I scraped together money to pay into my pension even when I was on maternity leave. If you don’t earn enough to pay tax, you can still put up to £2,880 into a pension each year and get it boosted to £3,600 with tax relief. Pensions are only one way of funding retirement though – I’ll be using a combination of my personal pension, work pension from back when I was employed, state pension, rent from a buy to let and investments sheltered from tax in individual savings accounts (ISAs). Many people will have found that their pension contributions tripled in April this year. If you have expensive debts such as credit cards, or you are trying to save for a house deposit, you may be wondering if you should stop paying into your pension for a while. This depends on your situation, but for most people the answer is probably No as this article discusses. We plan on retiring early in a couple of years so need both pensions and pre-pension money. We have saved money into a SIPP for hubby which we can draw down from when he hits 55. We have two years cash in the SIPP so we know we can draw down without selling stocks if they have dropped significantly. We will be topping up our National Insurance Contributions to ensure we get the maximum state pension. At a yearly cost of £741 this is a bargain for the extra pension you get. My pension will be a mixture of four main income sources. From my property where most of our money is now, from my pension, from my investments and from my businesses. Lots of things are working together to provide a nice bundle of cash. However I also think life is also for living (particularly as my parents died at 58,63) so its a balance of saving just the right amount of money and enjoying my life to the full. There’s some brilliant ideas here so whether you just have a little bit of money to put aside each month or you have a bigger chunk to spare, there’s something you can be doing to help with your retirement planning!